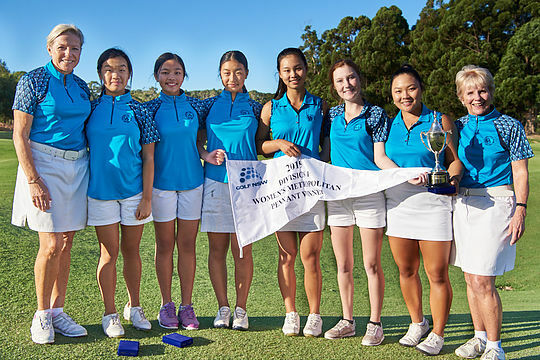 Concord has successfully defended their Division 1 Women’s Sydney Major Pennant Crown against St. Michael’s with a 3&2 victory at Terry Hills Country Club on Sunday. St Michael’s were looking for their maiden Division 1 flag after a number of years of being runner-up and looked to have the early advantage after their number five, Makensie Toole was too strong for Madison Woodley with a 5&3 victory. But wins from Concord’s Sophie Yip with a 2&1 victory over Danielle Vasquez at number three and with the top order match between state players Doey Choi and Stephanie Kyriacou going in Choi’s favour with an impressive 3&2 win, Concord had two matches in with two in the balance. Kelsey Bennett at number two for St Michael’s was in control of her match moving to be 2-up with three to play, yet a battle was brewing between the number four’s, Concord’s Angelina Gong and St Michael’s Casey Cook. Gong and Cook had been exchanging holes through their match and by the 16th the pair were inseparable. A lovely up and down by Cook on the 17th kept her and St Michael’s chances alive as the paid headed down the 18th and where the drama unfolded. With both drives on the fairway, Cook pulled her approach into the green side left trap to open up an opportunity for Gong, yet Gong also pulled her approach long and over the green. Needing to get up-and-down to remain in the match Gong executed a delicate flop shot to land on the green, some five metres from the hole. Cook then over-hit her bunker shot landing off the green giving the advantage back to Gong who made no mistake with her putts to secure a vital 1-up result and with it, Concord’s second Pennant in as many years. With the result determined the Bennett and Belinda Ji match was declared halved.